Rhododendrons are renowned for their great blocks of colours as the branches become obscured by a profusion of beautiful flowers. They are also extremely easy to grow. 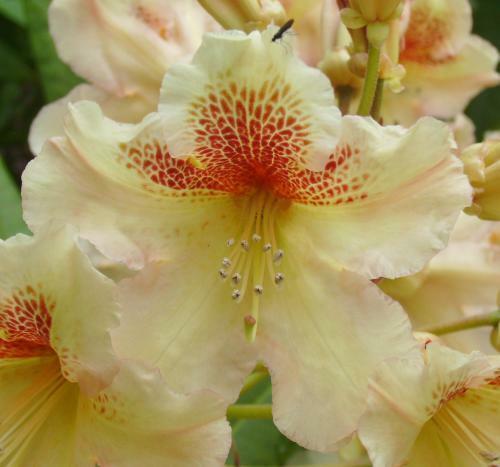 The 'Bernstein' produces yellow and orange spotted blooms. Beautiful trusses of yellow and orange, funnel-shaped flowers with a dramatic orange spotting on the upper petals. Flowers in late Spring. Rhododendrons are a fully hardy, evergreen shrub. They can be grown in borders and containers, and are excellent for brightening shady areas. Some hybrids are suitable for exposed sites, hedging or informal screening. No pruning is really neccessary apart from the removal of misplaced or crossing shoots after flowering. This will help maintain a healthy and neat framework. Rhododendrons are renowned for their great blocks of colours as the branches become obscured by a profusion of beautiful flowers. They are also extremely easy to grow. The 'Cunningham's White' bears a white bloom. Rhododendron 'Roseum Elegans' Rhododendrons are renowned for their great blocks of colours as the branches become obscured by a profusion of beautiful flowers. They are also extremely easy to grow. The 'Roseum Elegans' bears a lavender flower, featuring attractive reddish brown spots. The flower gradually fades to pink.